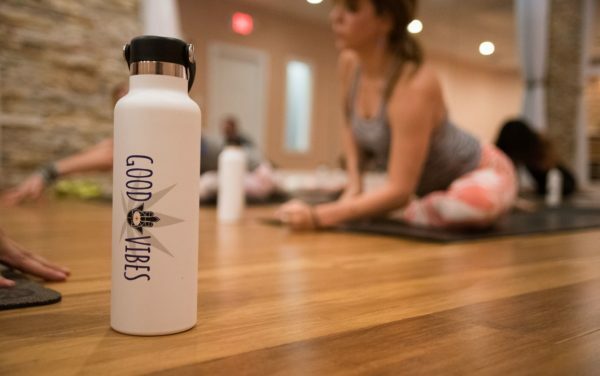 We believe it’s the best pound for pound reusable water bottle on the market. Keep things hot or cold all day long. Hydroflask uses TempShield™, in every product they make. It’s their double wall, vacuum insulated technology that guards the temperature of your drink. Bring ice water with you in the morning, and they promise you’ll still have ice in the afternoon. Or keeping your coffee or tea hot. The bottle is lightweight and durable. Yogis and Yogini’s often use reusable water bottles but on our studio’s opinion, for yoga, working out, hiking, or just in your daily activities Hydroflask is the undisputed, pound for pound, best water bottle out there and contributes to a sustainable effort to cut back use of disposable plastics or instead of building a personal collection of mediocre water bottles, get one that is consistent and long lasting.